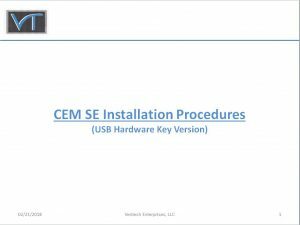 CEM SE and the hardware key security software (Sentinel Key Driver), are designed to run on Windows based operating systems only. It is compatible with Windows 7, 8 and 10, as well as many of the older Windows platforms. Important: Ensure that your hardware key is not installed in your computer or server until STEP 28, to prevent installation failures. 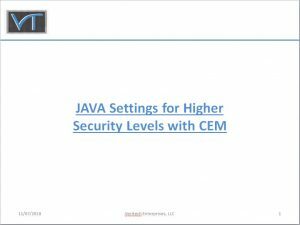 CEM has experienced problems with newer versions JAVA SE Runtime software, due to increased security levels forced by JAVA. (The higher security levels prevents some of the graphics from loading.) Version 7.0.9 (JAVA SE Runtime Environement 7u9) is the latest know version to run without causing any security issues within CEM, when using the standard JAVA installation settings. Some users have indicated that changing the JAVA security level to “Medium” in the Java Control Panel can correct the issue, but it is unknown if this works for all JAVA versions that have this option available. Starting with version 8u20, JAVA removed the “Medium” security level setting. However, for versions 7u51 and later, the “Java Control Panel” was added, which contains the “Exception Site List” that will allow the applets to run on user designated websites or programs, and bypass the security level restrictions that cause problems within programs like CEM. Note: These procedures have only been validated on Windows 7, 8 & 10. It is unknown if they work for earlier versions of Windows. Scroll down to Java SE Runtime Environment 7u9, and download version Windows x86 Offline. If you don’t already have an Oracle account set up, it will require that you create one. Microsoft no longer supports Windows Help files in the newer operating systems. In order to activate the HELP files within CEM PE for Microsoft Vista, 7, 8 and 10, and additional executable file must be run after the primary installation is completed. Follow the step-by-step instructions found below, depending on your particular operating system.